Summer may be coming to an end, but CloudSpot's updates are just getting warmed up for the year! 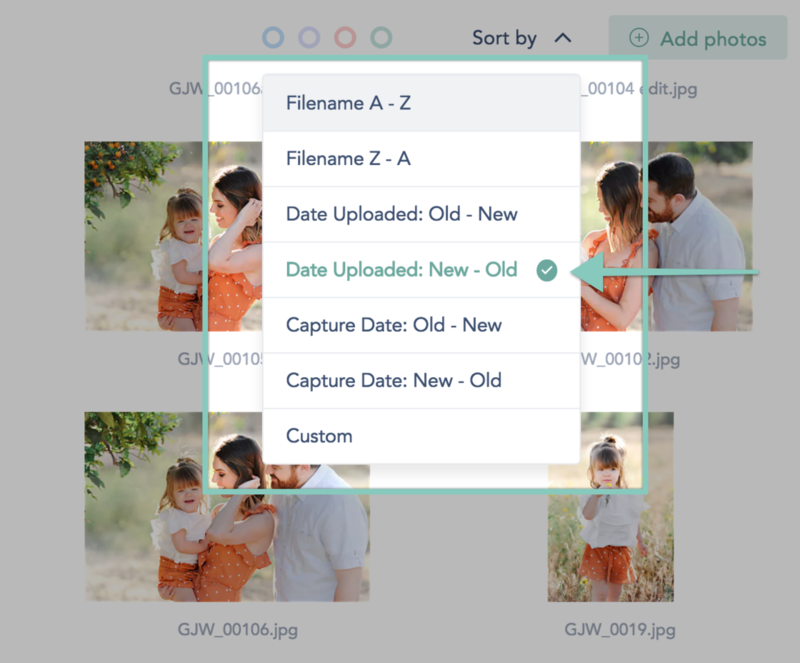 This update has improvements to your client's experience when downloading their photos as well as enhancements to your Home Page. Check em' out! When you click on a category on your homepage, the URL in your browser will change and reflect the selected category. This URL can be copied and shared as a direct link to just your galleries in that category! 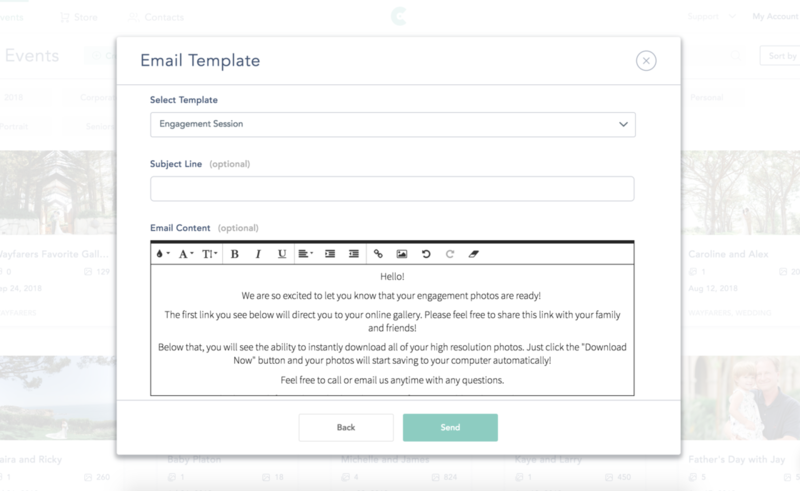 When you email your gallery to your clients, you will be able to select your Template and change the email's Content all in the same step of the sharing flow! 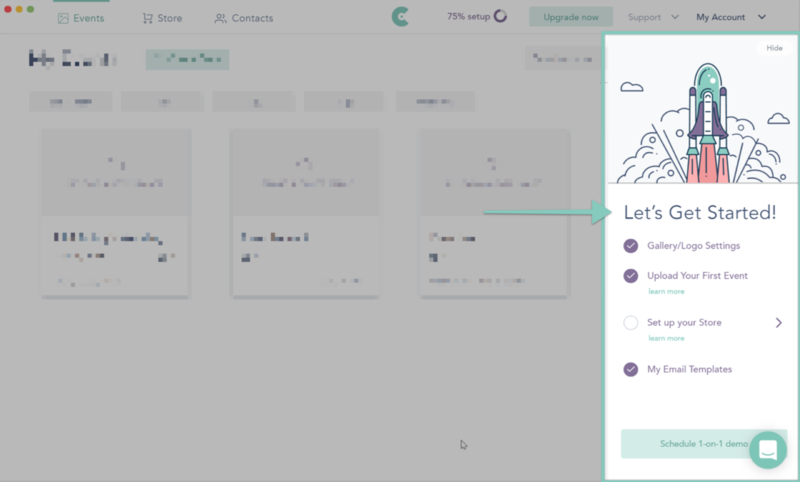 Since the launch of our web version the CloudSpot team is constantly making optimizations to help your experience be more intuitive and smooth. Here are just some of the new things you'll notice! In case you're ever needing to quickly jump back to see all of your Events, we'd added a quick little shortcut! The sections in your Account Settings needed a bit of updating to mesh better with the rest of the application, so we prettied them up. We lost count, actually...our team is rocking! 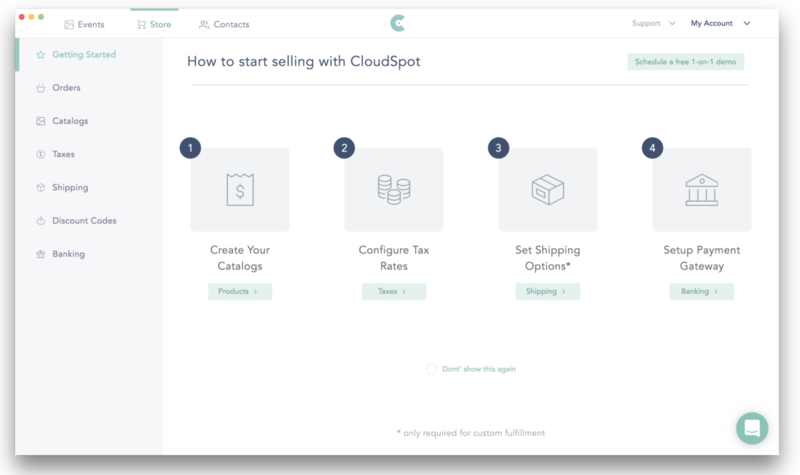 We are excited to announce that you can now access your CloudSpot account on the web in addition to our desktop application! This has been the largest feature request by our community and our team has been hard at work to make this happen. We couldn't be more delighted to make this available to everyone! Additionally, you can use CloudSpot on your tablet device as well! Yes, you can even upload images via your iPad if needed! What's the difference if I use the web version? One of the huge benefits in using CloudSpot on the web is that updates, fixes, and optimizations are rolled out almost daily. No need to download or install a new version, it's just automagically available to you. This means that today's release already has a TON of new things in there waiting for you to explore. 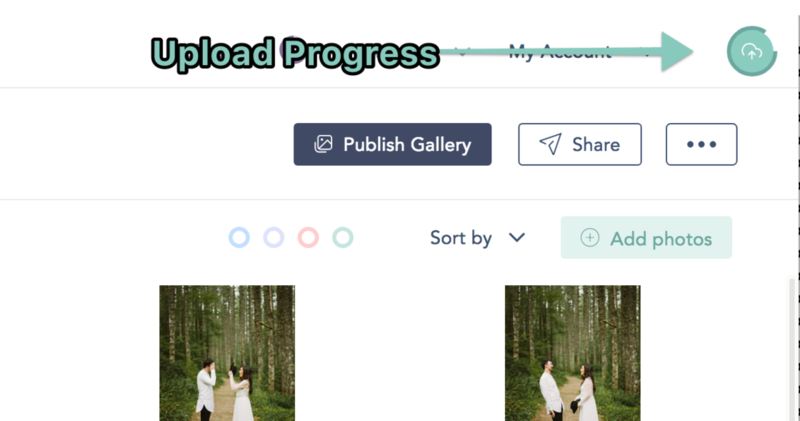 Adding covers in our new interface was a bit confusing, so we've placed an easy drag/drop target within your Event to quickly set/change your Event cover photo! 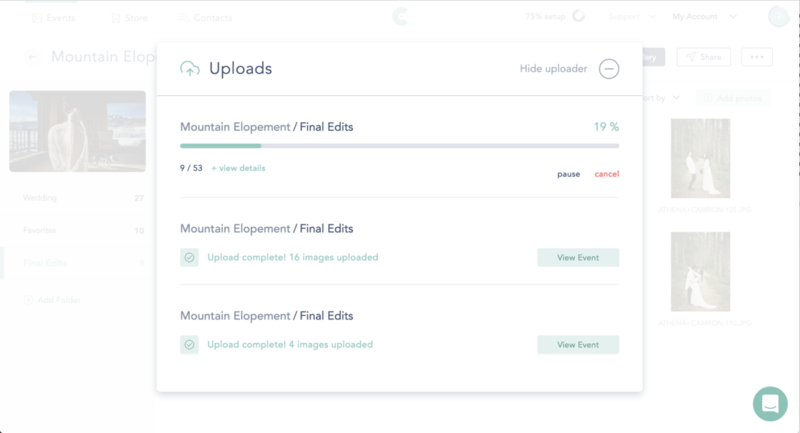 Our team has completely rebuilt the upload process and have included an upload progress indicator for those times where you minimize your uploads and continue working within CloudSpot! We have automatically enabled these two most popular features by default. This will apply to all future galleries created - yay for less clicks! 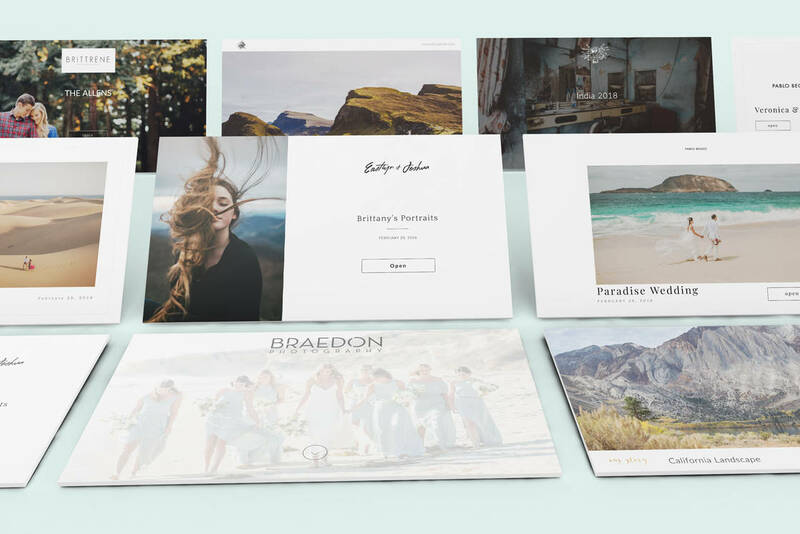 If you don't have any images in a given folder, you'll see a handy-dandy drag and drop target to get those beautiful photos uploading in no time! Copying a Catalog now correctly copies over all items, prices, and markups. 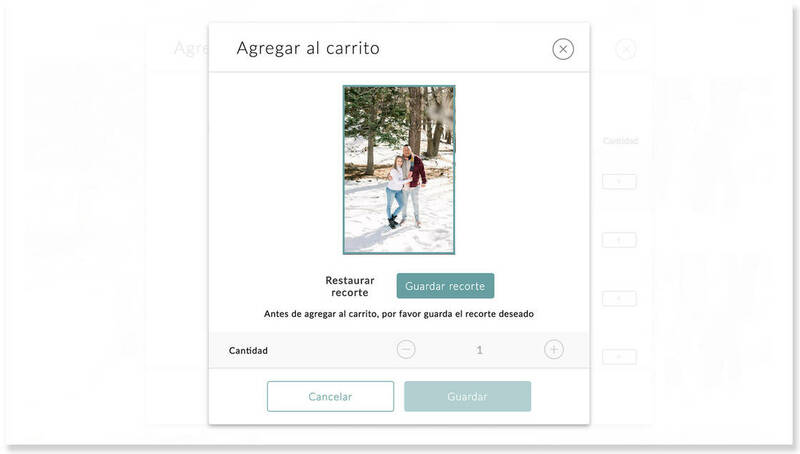 The "Date Captured" image sorting feature is now working correctly. 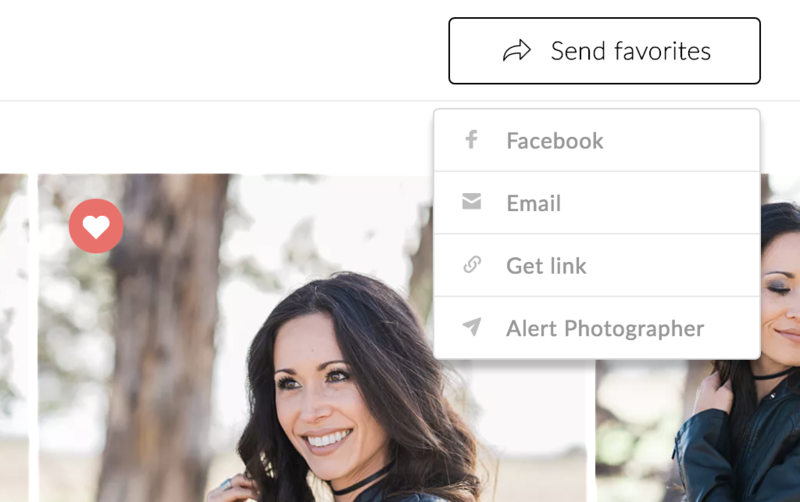 We've adjusted some of the button behavior when customizing gallery cover photo settings. We've been blown away by all of the amazing feedback from our Community since launching the huge CloudSpot redesign last week! The previous interface was confusing, so we've now created two separate sections for these settings. 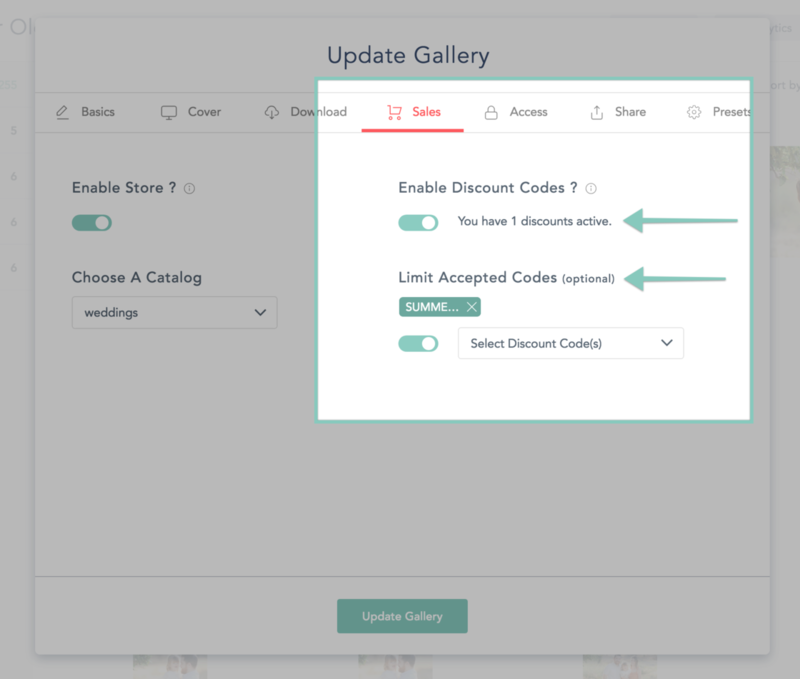 One turns all Discount Codes on/off and the other section allows you to enable and limit usage to only specific codes in a gallery. 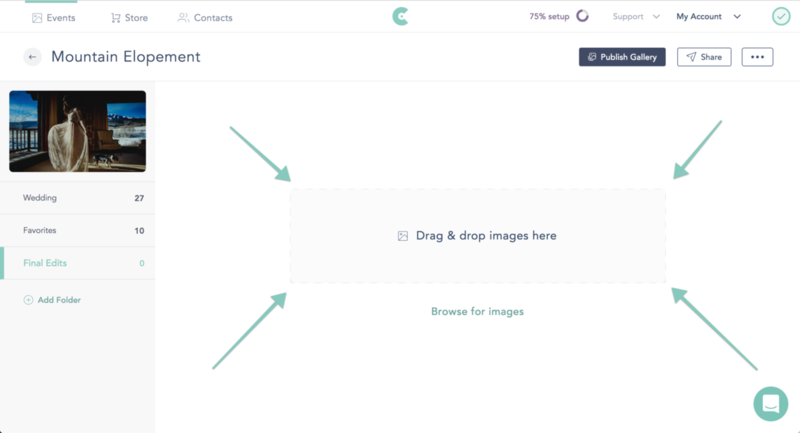 When sorting images in a folder, you can now drag and scroll further down the page in one action. Deleting one or more images in a folder no longer jumps you to the top of that folder. Connecting a Stripe account is no longer required to complete the Store section of the Getting Started helper. There is no longer a delay in Cover images appearing after you sort Events. Duplicate Event names are now allowed. Since CloudSpot launched, our incredible community has not only exponentially grown, but creatives like you have shared invaluable feedback with us on CloudSpot's interface and features - we are so grateful! 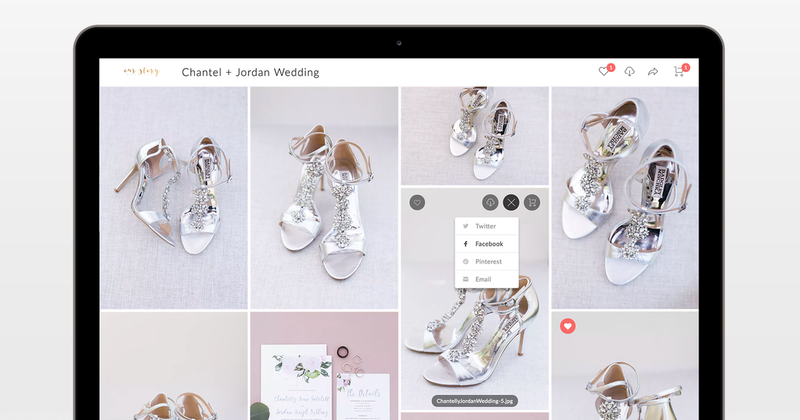 Today's changes reinforce our continued commitment towards building a platform that is easy to use, saves you time in your workflow, and makes your business shine even brighter in the eyes of your clients! Here are some of the most notable improvements we've made - we can't wait to show you what's next! You now have all of your Events displayed right when you log in. We've also made it much faster and easier to filter, search, and jump right to the Event you need! Event Categories have now transformed into Event Tags! You can now add one or more tags to an Event which will allow you to more quickly access and filter your Event Dashboard. 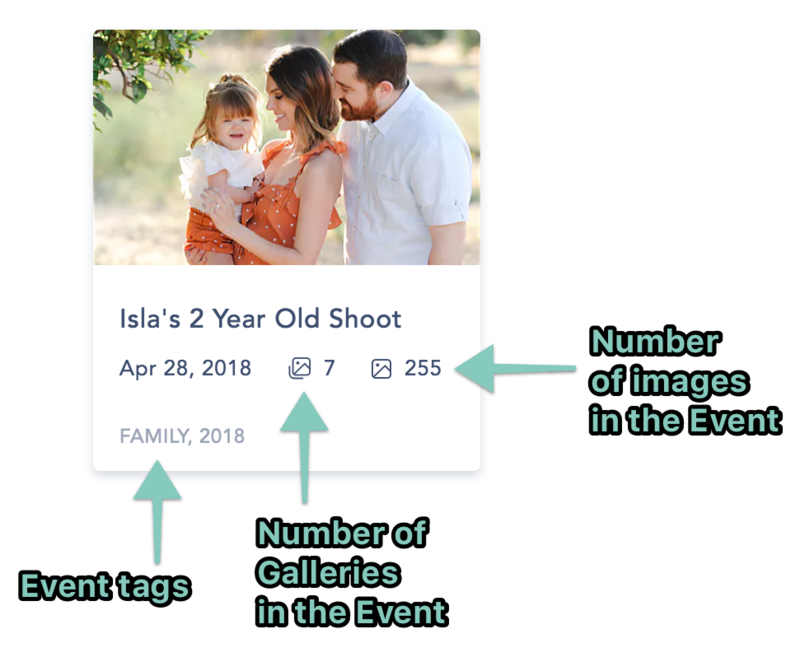 As you browse your Events, you can easily see how many images, galleries, and tags you have assigned to any given Event. Whether it's on your main Event Dashboard or within the Event itself, you'll see Quick Action shortcuts to speed up your workflow. Once you upload photos to an Event, you can manage everything on a single page. Assigning or changing a cover photo to an Event is lightning fast! Once you select one or more images, you'll now see options appear at the bottom of your screen to copy, move, delete, or share instantly. 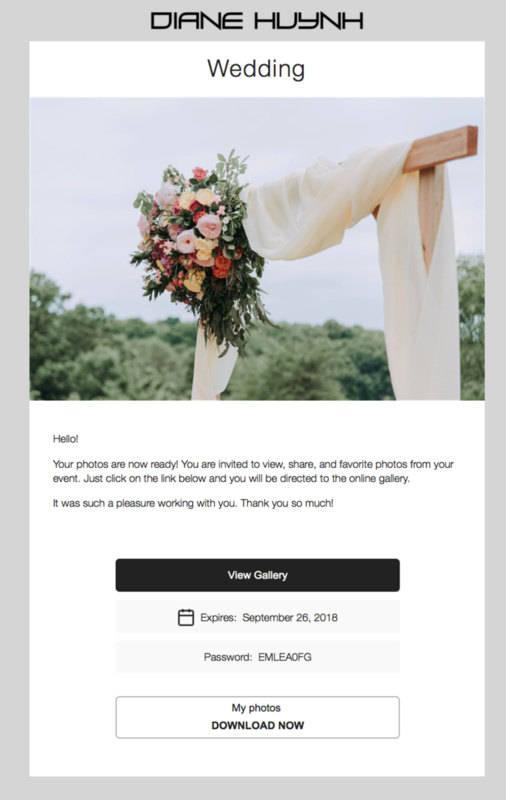 Galleries created within Events now have a new look! 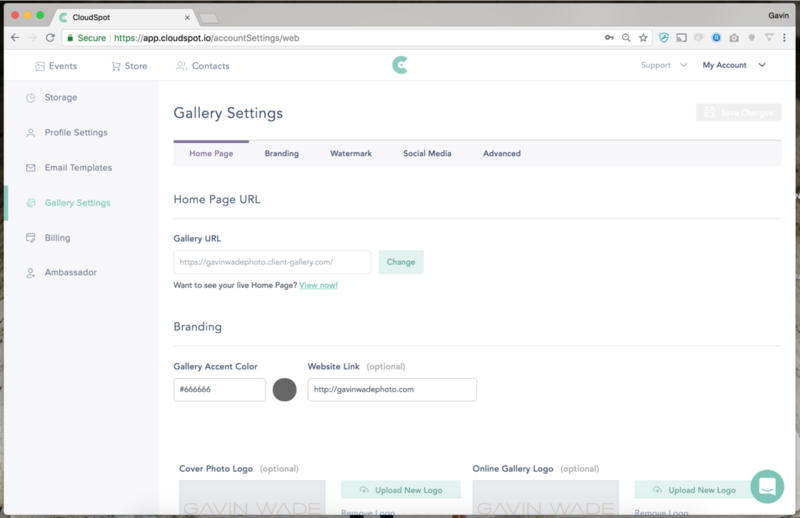 At a glance you can see important gallery settings, quickly view the gallery, or share it to clients. 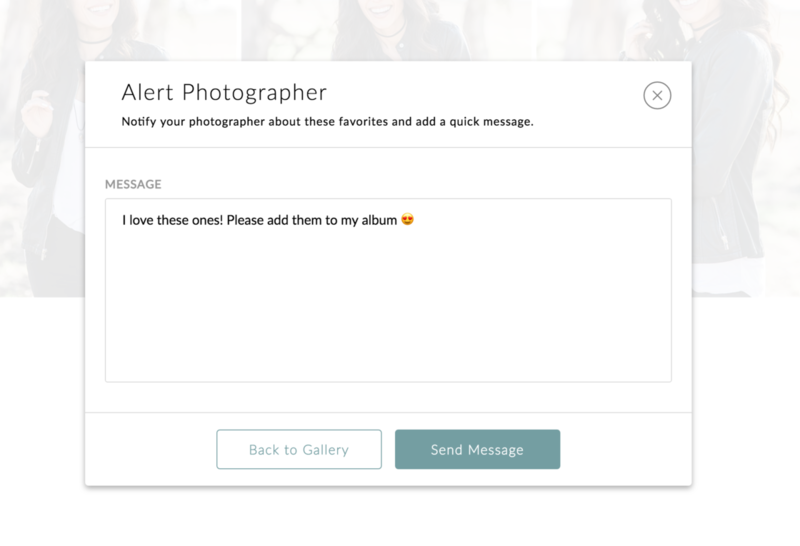 We’ve recently released another update to your Client Gallery Experience! Thank you to everyone who reached out and shared feedback with us after the big launch a couple weeks ago! We’ve heard you, and are excited for you to check out these brand new changes! A Dark Theme for Galleries: We've inverted the light color scheme to add an additional option for your gallery colors! 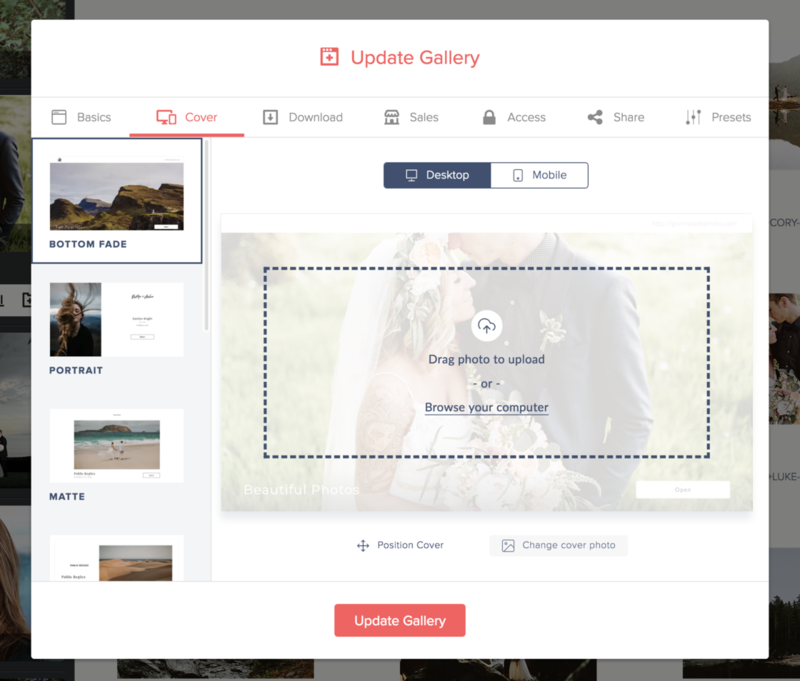 We can’t wait for you to check out all of these new ways to better customize your gallery experience - keep that feedback coming! As we continue to build CloudSpot to be the best tool for your growing business, please note some key changes to those currently trialing our platform on the Free plan. 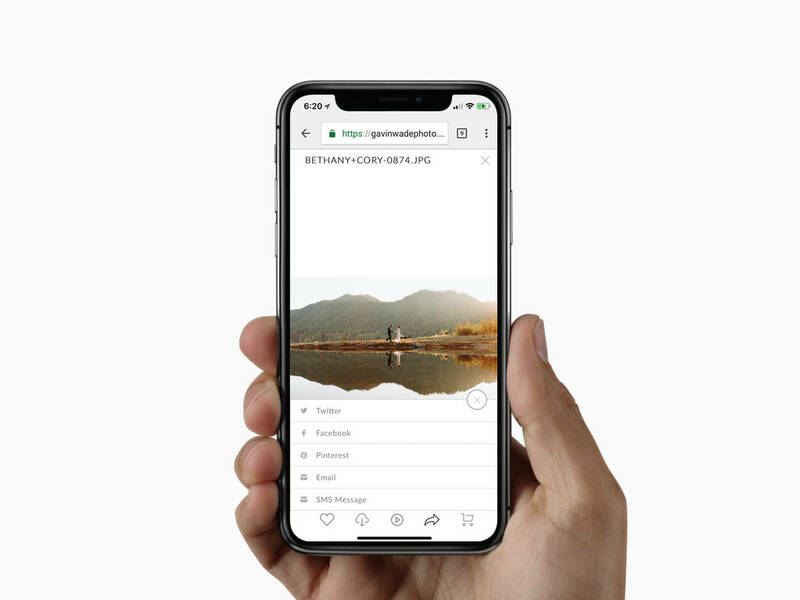 Image Size Delivery Options: Image delivery sizes have been limited to 3600px (roughly an 8x10 size) on the longest edge for photographers trialing our service on our Free plan. 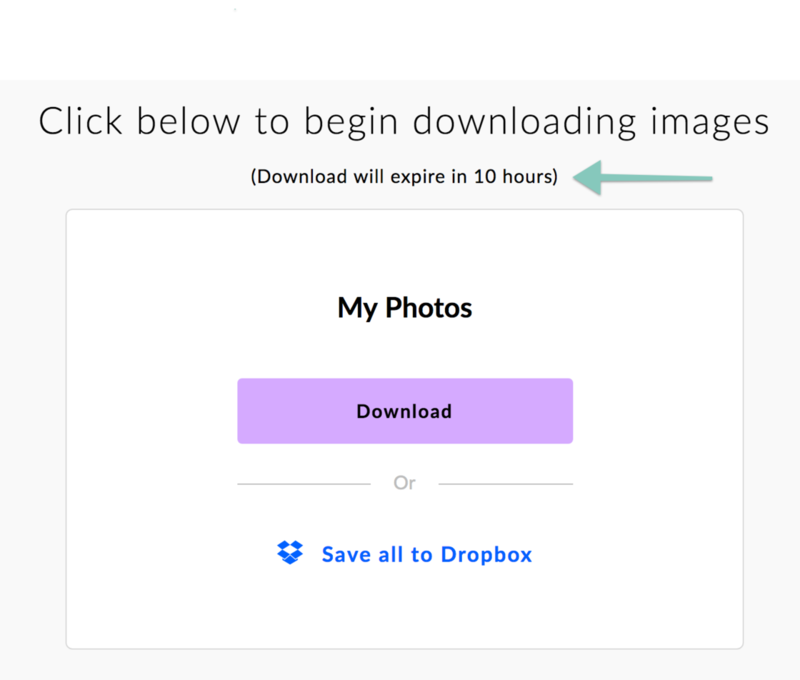 NOTE: We still safely store the exact file you upload to us, but delivering that Original size in either a direct download link or in your gallery settings now requires an upgraded plan. Your New Client Gallery Experience is Here! We've taken things to another level when it comes to the experience your clients are going to have in their gallery! Here are just some of the new things we know you're going to love! 7 New Gallery Cover Designs: You now have more options to match your unique style in your client galleries. You can choose your cover design in the new Covers section added to your Gallery Settings and get a live preview of what it will look like on web or mobile devices! 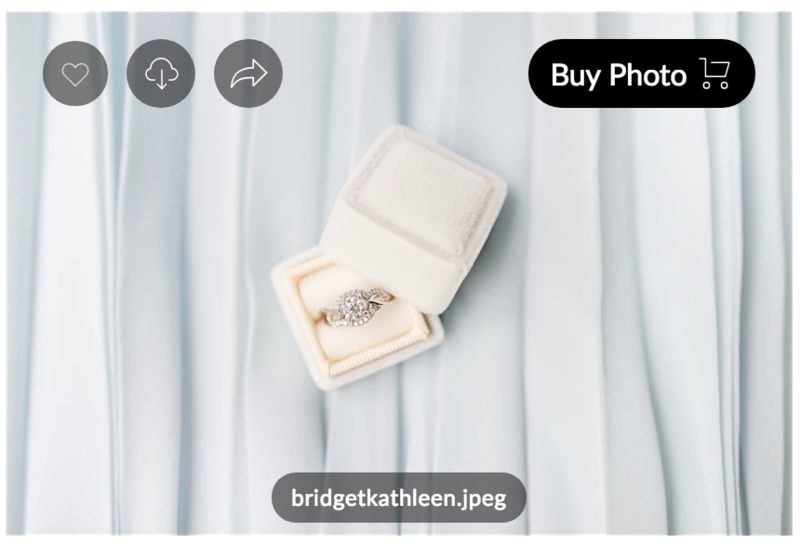 Set Unique Cover Images For Every Gallery: When creating multiple galleries within an Event you can now set a unique image for each and every gallery! 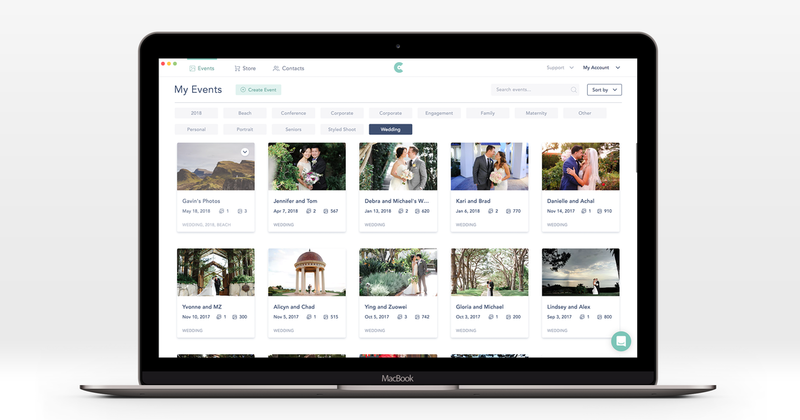 Organizing multiple shoots for the same client is now possible within the same Event! 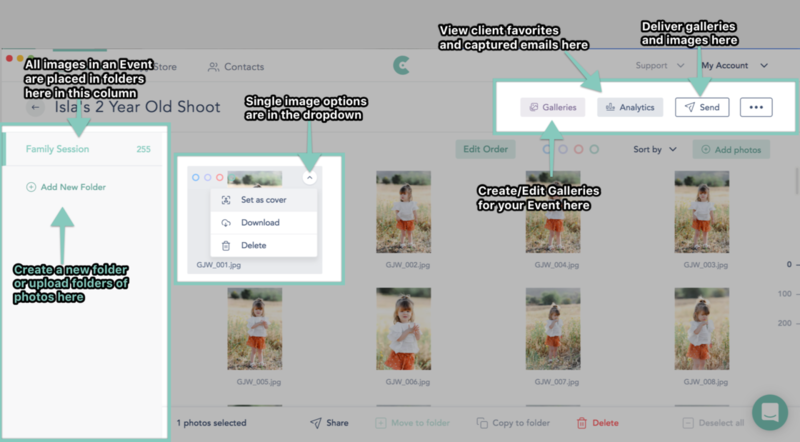 Clients Can Share Favorites: Your clients can now mark their favorite photos and share a link to anyone directly to those images via email, SMS text, or copy the direct link. 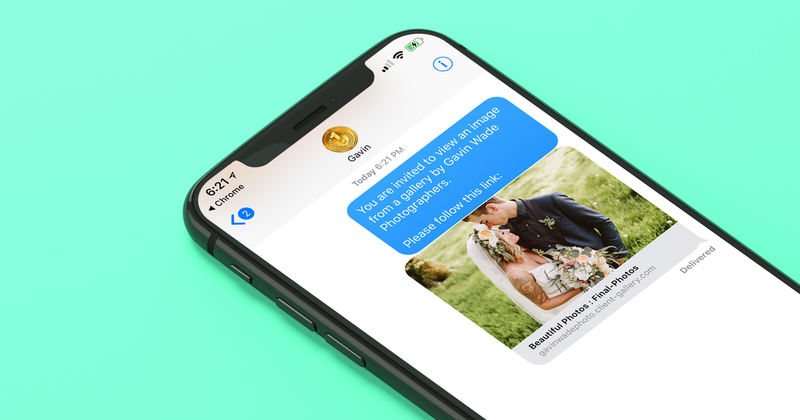 SMS Sharing: Clients can now share a single image, just their favorited photos, or the entire gallery directly via text on any mobile device! Easier Mobile Downloads: We've added an icon on mobile devices to indicate that you have allowed downloads within the gallery. 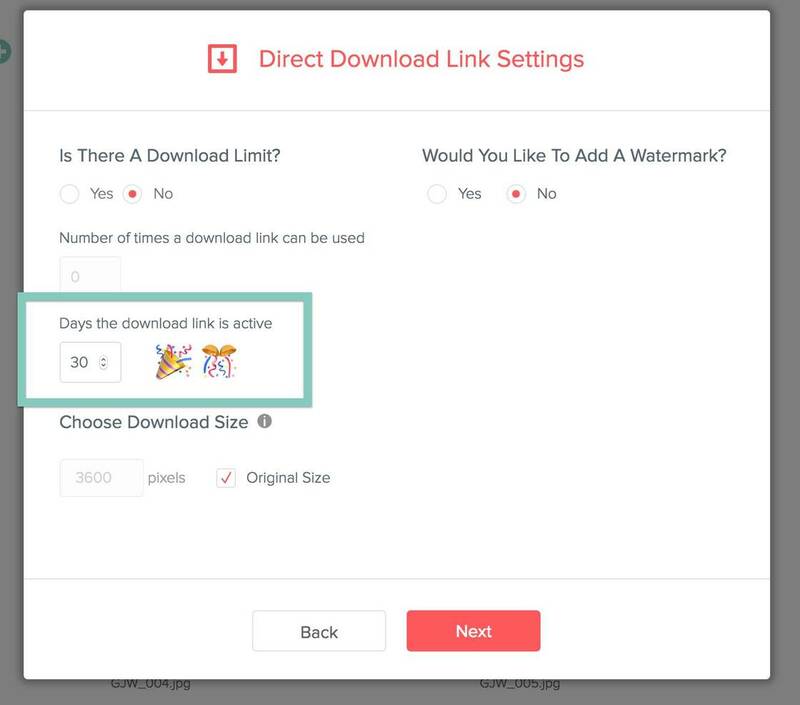 Clients can now easily save an image to their device at whatever size you allow. 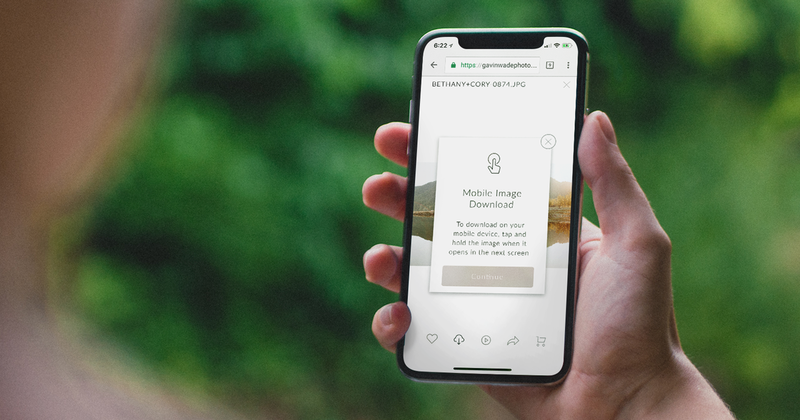 Slideshow Feature: At the tap of a button, your clients can start a beautiful slideshow that advances through your gallery images. Easier Folder Navigation: Gallery folders/categories are no longer hidden in a dropdown menu. They are easily accessible and will scroll immediately to that section in the gallery. Image Filenames Visible: The image filename is now visible when you hover over the image in the gallery. You no longer need to click on the photo to see the name. To disable filename display, you can toggle that OFF in your gallery settings. 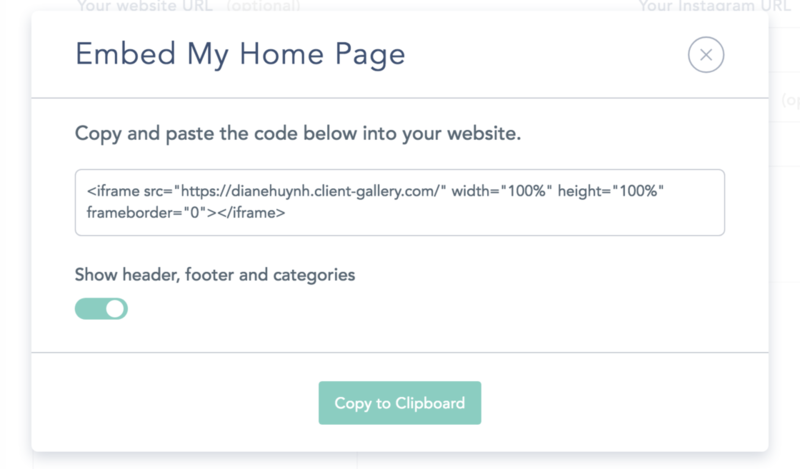 Home Page Search: We've added a handy search feature to your Home Page so clients (or you) can quickly jump to any gallery - no more scrolling for dayzzz. 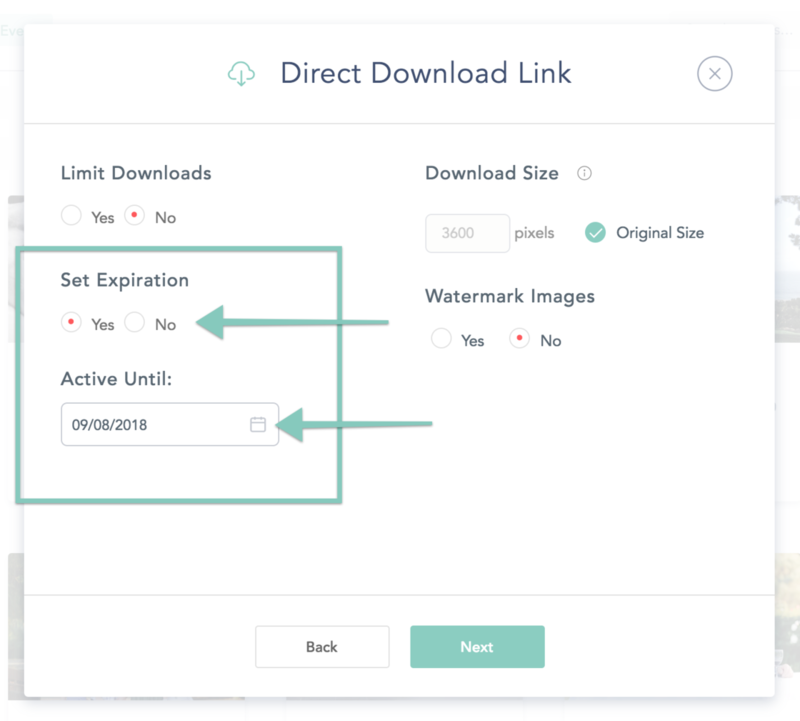 New Download Page Design: We've updated the design of the page your clients will see when they click on a "Download Now" link in your CloudSpot emails. Store > Discount Codes: The "Max # of uses" setting for discount codes is now on a per-gallery basis and no longer is applied across all galleries. This allows you to create one discount code to give to all clients and not have to create unique codes for each! Store Activity Section: We've removed this to make way for new things coming soon! Gallery Presets: For users on our free tier, there was some odd formatting on some of the preset buttons. We couldn't sleep knowing a few buttons didn't look good, so we fixed em! Surely Cloud Spot will start publishing changelogs very soon.